Workers at the event preparing documents to be shredded. Last week the Lawrence-Scioto Solid Waste Management District held its annual Scioto County Document Shred and E-Waste Day Friday at Valley Wholesale Foods in Portsmouth. Participation nearly doubled for the 2016 event, compared to 2015 participation. The event in Scioto County was held on a Friday and a similar event was held on Saturday in Lawrence County. This annual event is designed to help residents dispose of broken or unwanted electronic items as well as shred various documents. Dan Palmer, director of the Lawrence-Scioto Solid Waste Management District, said he was pleasantly surprised at the participation levels in Scioto County. In total there were 175 vehicles that participated in the event. 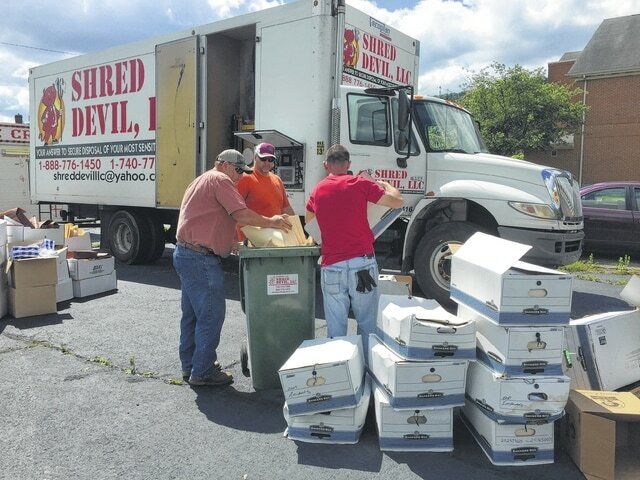 At the Scioto County event in 2015, there were 40 vehicles dropping off items for document shredding, which consisted of 6,060 pounds of materials. There were 35 vehicles for E-waste dropping off 1,500 pounds of materials. Through these events residents of Scioto and Lawrence Counties were provided at no cost the opportunity to shred documents. At the 2015 Document Shred and E-Waste Day in Lawrence County, there were 65 vehicles for document shredding dropping off 4,400 pounds of materials. There were 35 vehicles for E-waste dropping off 1,700 pounds of material. At the 2016 E-Waste and Shred Day in Lawrence County saw 54 vehicles for document shredding, which amounted to 5,460 pounds. There were 51 vehicles for E-Waste which resulted in 800 pounds. “I’m very happy with the totals, (collectively between Scioto and Lawrence County) there were 280 vehicles which resulted in 13,400 pounds shredding and 5,300 pounds of E-Waste,” Palmer said. Upcoming programs for the district includes a Portsmouth Citywide Cleanup Day June 4 and a recycling appreciation day June 9 in Lawrence County. A recycling appreciation day in Scioto County on June 10 and the annual Ohio River Sweep on June 18. For more information about the Lawrence-Scioto Solid Waste Management District, visit www.lsswmd.org.